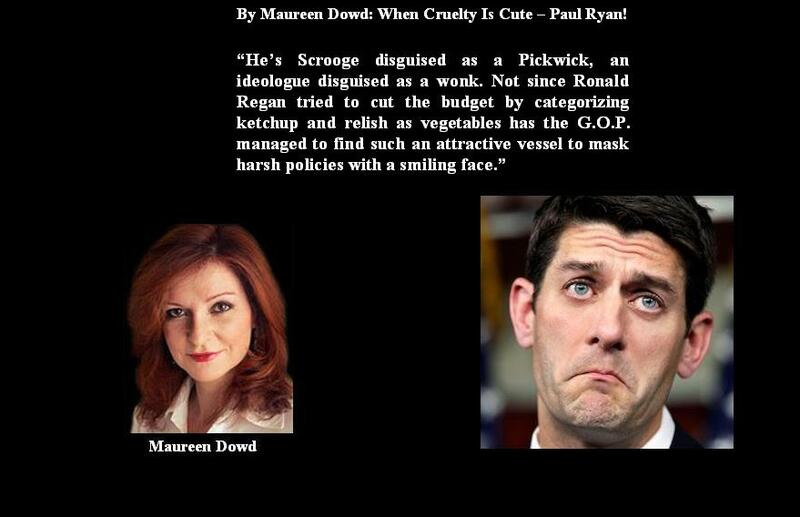 When Cruelty Is Cute – Paul Ryan! I’d been wondering how long it would take Republicans to realize that Paul Ryan is their guy. He’s the cutest package that cruelty ever came in. He has a winning air of sad cheerfulness. He’s affable, clean cut and really cut, with the Irish altar-boy widow’s peak and droopy, winsome blue eyes and unashamed sentimentality. He’s Scrooge disguised as a Pickwick, an ideologue disguised as a wonk. Not since Ronald Reagan tried to cut the budget by categorizing ketchup and relish as vegetables has the G.O.P. managed to find such an attractive vessel to mask harsh policies with a smiling face. The Young Gun and former prom king is a fan of deer hunting, catfish noodling, heavy metal and Beethoven. He’s a great dad who says the cheese, bratwurst and beer of Wisconsin flow in his veins. He’s so easy to like — except that his politics are just a teensy bit heartless. For the rest of us, at least, Ryan is not going to raise our hopes only to dash them. Unlike W., he’s not even going to make a feint at “compassionate conservatism.” Why bother with some silly scruple or toehold of conscience? Like Mitt Romney, Ryan truly believes he made it on his own, so everyone else can, too. He shrugs off the advantage of starting as the white guy from an affluent family, able to breeze into a summer internship for a Wisconsin Republican senator as a college student. Only 16 and the youngest of four when he discovered his lawyer dad dead in bed from a heart attack at 55, Ryan had to grow up fast. The Midwestern kid was guided by what David Stockman calls “Irving Kristol’s ex-Trotskyites” turned neo-cons; Jack Kemp, the cheery supply-sider who actually cared about the disadvantaged, and by one of Kemp’s favorite authors, Russian émigré and cult leader Ayn (pronounced like swine, as she used to say) Rand. Ryan co-sponsored the Sanctity of Life Act enshrining a fertilized egg with the definition of “personhood” and supported a bill Democrats nicknamed the “Let Women Die Act,” which would have let hospitals that get federal money deny women abortions even in life-threatening circumstances. And Rand would not have approved of Ryan’s votes in the House backing W.’s profligate spending on unwinnable wars, a bank bailout and a Medicare expansion. She would no doubt have been thrilled, however, that under the Ryan budget plan, the megarich Romney would go from paying shamefully as little as possible in taxes to virtually no taxes. Ryan was drawn to Rand’s novels, with their rejection of “the altruist morality,” making narcissism a social virtue; her exhortation that man must not only strive for “physical values” — her heroes were hot — and self-made wealth, but a “self-made soul.” Like John Galt, who traces a dollar sign “over the desolate earth” at the end of “Atlas Shrugged,” Rand idolized the dollar. She wore a brooch shaped like a dollar sign, and a 6-foot dollar sign stood beside her coffin at her wake. Although the Catholic Ryan told Fox News’s Brit Hume in an interview that aired Tuesday night that he “completely disagreed” with Rand’s “atheistic philosophy,” he said his interest in economics was “triggered” by her. His long infatuation with her makes him seem even younger than he looks with his cowlick because Randism is a state of arrested adolescence, making its disciples feel like heroic teenagers atop a lofty mountain peak. The secretive, ambiguous Romney was desperate for ideological clarity, so he outsourced his political identity to Ryan, a numbers guy whose numbers don’t add up. This just proves that Romney will never get over his anxiety about not being conservative enough. As president, he’d still feel the need to prove himself with right-wing Supreme Court picks. Ryan should stop being so lovable. People who intend to hurt other people should wipe the smile off their faces.